Many European trains have designated spaces for wheelchair users. The accommodation depends on the specific train and rail operator and typically requires advanced booking. If you have booked a ticket for a bus operator via Loco2, you will need to contact the coach company directly if you use a wheelchair, have limited mobility, or need assistance to get off or on the bus. Frustratingly, it isn't possible to make these bookings with Loco2, since the rail operator's online systems don't incorporate wheelchair reservations. But the following guidelines will give you an idea of what to expect and how to book. Most modern European trains have designated spaces for wheelchair users, which are located near wheelchair-accessible toilets. They are often alongside a "companion" seat for a fellow traveller. If the wheelchair user can sit in an ordinary seat, a standard seat can be booked and the wheelchair can be folded and stowed away on the train. You can request assistance at the station and help boarding the train from most operators (see our article Station assistance & boarding the train). Unfortunately, some night trains do not cater for wheelchair users. Please contact us prior to booking so that we can provide detailed advice for the specific night train you want to book. Please note that wheelchair spaces cannot currently be booked on Loco2. See below for more information about how to book wheelchair spaces. If you can board the bus without your wheelchair or mobility device, you can travel on any bus on a normal ticket. Your wheelchair should fold down and be stowed with luggage. It's possible to book wheelchair spaces with Eurostar online or by calling +44 (0)3432 186 186. All spaces are in the Standard Premier or Business Premier carriages next to wheelchair-accessible toilets with push-button access. A seat for a companion can be booked next to a wheelchair space at a discounted rate. It is recommended that wheelchair users arrive at the station at least 45 minutes before departure. A ramp will be set up for boarding. Further assistance can be arranged by asking at the Eurostar ticket desk upon arrival. If you have booked a wheelchair space, assistance does not have to be arranged in advance. All spaces are near wheelchair-accessible toilets. One companion may also be eligible for a reduced fare. All Italo trains have wheelchair spaces in Carriage 8. You'll need to ring Italo at 011 39 06 0708 to book wheelchair spaces or to request assistance at the station. Thalys has designated wheelchair seating, but it cannot be booked online. Passengers traveling in a wheelchair will need to book directly with Thalys. This can be done at the station or by phone. Calling Renfe on +34 902 24 05 05 (Spanish only). During this call, wheelchair users can ask for special assistance in the station. Renfe will automatically organise assistance for getting onto the train. Via the Renfe website, by ticking the box which states, "Travel in your own wheelchair on the outward journey" (Viaja en su propia silla de ruedas para la ida) after you have selected your preferred train. This reveals a window to select the type of assistance your need. 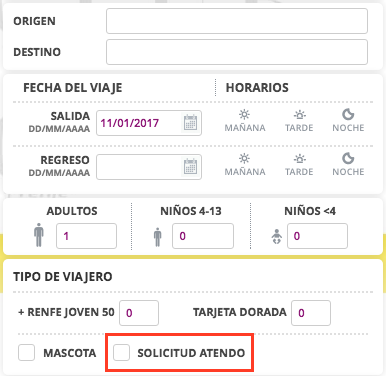 The options appear in Spanish, even if you have the site set to English, so select "Travel in a wheelchair" (Viaja en silla de reudas, Plaza H). Wheelchairs cannot exceed the following dimensions: width 70cm, depth 130cm, and height 140cm. Bookings for wheelchair spaces must be made at least 12 hours before the train departs. It is recommended that travellers in wheelchairs arrive at the station at least 30 minutes before departure. If you don't travel in a wheelchair, but would like to request assistance at the station you can contact Renfe's Atendo team. Passengers traveling in wheelchairs or who require assistance in stations will need to request help at least 24 hours in advance of travel, via Trenitalia's Sale Blu ("Blue Hall"). This is managed by Trenitalia's RFI - Rete Ferroviaria Italiana - department. Wheelchair spaces are independent of actual tickets, so you'll need to have tickets pre-booked before requesting a wheelchair space. In person at a Sala Blu office in specified stations in Italy. By ringing Sala Blu: 199 30 30 60, or Trenitalia's call centre: 199 892021 option 7 (both from within Italy) or for international calls +39 06 47308579. By emailing SalaBlu.ROMA@rfi.it (recommended for passengers from outside Italy). Most trains can accommodate wheelchairs that are 70cm wide and 120cm long. There's a small number of older trains that can only carry wheelchairs with a maximum width of 67cm. National Rail Enquiries have more information about to how to book wheelchair spaces on the UK rail network, including contact details. Holders of a Disabled Persons Railcard get 1/3 off adult rail fares for travel on the National Rail network in Great Britain. If you're travelling with another adult they will also get 1/3 off their rail fare. SBB has made lots of adjustments to trains, stations and passenger information to ensure its customers can travel independently. For example, low-floor carriages on all regional service routes make it easier to board and alight. More and more stations are now also 100% accessible, with step-free access to the trains. To buy tickets, you can search for trains on https://www.sbb.ch/, then select 'barrierefreies reisen (barrier-free travel) to show trains that have wheelchair spaces on board. Some trains are barrier-free so wheelchair users can get on and off the train without assistance (these show a wheelchair symbol). Some require you to book assistance getting on and off at least one hour before travel by calling the number below (these show a wheelchair symbol in square brackets) or notify the driver who will provide ramp assistance.